A poor old prophet has lost his head. Talk to Geilir the Mumbling in his home, south of Thormoor's Watch. Travel southeast to Kolbjorn Barrow. 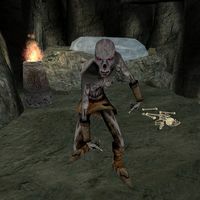 You'll come across Geilir the Mumbling in his dwelling on the western shore of the Solstheim south of Thormoor's Watch. He'll tell you that his only friend, Oddfrid White-Lip has been taken by Draugr to Kolbjorn Barrow, and asks you to rescue her. Kolbjorn Barrow is located to the southeast, slightly west from Fort Frostmoth. The barrow is small with a few Draugrs inside, but no immediate sign of anyone named Oddfrid. 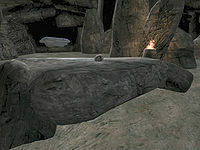 On a more careful inspection, you find a single skull on the altar in the center of the three Stalhrim named Oddfrid. Either Geilir forgot to tell you something or Oddfrid was killed. When you return to Geilir with Oddfrid the skull, he is elated and thanks you but offers no reward other than to tell your future. If you have finished the Main Quest, Oddfrid mentions something cryptic about "when the dragon dies, the Empire dies", which refers to what happens in Oblivion (see the Easter Eggs). Otherwise, she says "the time for the hunt is near. You are both hunter and hunted..." which refers to Hircine's Hunt, the final scene of the Main Quest. 10 I met a sad warlock and seer named Geilir the Mumbling. His family was recently lost at sea, and now his only companion has been kidnapped by a draugr. 20 Geilir asked me to rescue Oddfrid White-Lip from Kolbjorn Barrow, but I refused. 30 I have agreed to help Geilir the Mumbling by rescuing Oddfrid White-Lip from Kolbjorn Barrow. As a reward, he will talk to Oddfrid and reveal my future. Kolbjorn Barrow is southeast of Geilir's dwelling, near the Solstheim coast. 35 I have agreed to help Geilir the Mumbling by rescuing Oddfrid White-Lip from Kolbjorn Barrow. As a reward, he will talk to Oddfrid and reveal my future. He will also reverse Thormoor Gray-Wave's curse of eternal wakefulness. Kolbjorn Barrow is southeast of Geilir's dwelling, near the Solstheim coast. 37 I found Oddfrid White-Lip, but Geilir failed to mention that she was just a skull. No matter. If I return the skull to Geilir, he should grant my reward. 40 I returned Oddfrid White-Lip to Geilir the Mumbling. Geilir admitted that Oddfrid was just a skull, but insists "she" talks to him. 100 Finishes quest Geilir the Mumbling told me my future. He said something about the beginning of a hunt, and me as both the hunter and hunted. I was surrouned [sic] by ice. He also said something about a giant and a horned huntsman. 110 Finishes quest Geilir the Mumbling couldn't tell my future, but Oddfrid did tell him about something else. He said that when the dragon dies, the Empire dies. He also said something about the lost dragon's blood and the Empire's sire, and the stemming of a blood tide. Geilir said it was all very cloudy, and does not refer to me directly. * This journal entry is just a cute little joke by the developers, since every journal entry which occurred from this point on would be below this one, thus giving a detailed chronicle of your "future" from the point at which you received the journal entry. Unfortunately, however, the quest never advances past the 110 index, so this entry will never be seen.